A not-null constraint is functionally equivalent to creating a check constraint CHECK (column_name IS NOT NULL), but in PostgreSQL creating an explicit not-null constraint is more efficient. What exactly does it mean by "more efficient"? What are the detriments of using CHECK (column_name IS NOT NULL) instead of SET NOT NULL? My wild guess: "more efficient" means "less time is required to perform the check" (time advantage). It may also mean "less memory is required to perform the check" (space advantage). It might also mean "has less side effects" (such as not locking something or locking it for shorter periods of time)... but I don't have a way to know or check that "extra advantage". I cannot think of an easy way to check for a possible space advantage (which, I guess, is not that important when memory nowadays is cheap). On the other hand, it's not that difficult to check for the possible time advantage: just create two tables which are the same, with the only exception of the constraint. Insert a sufficiently large number of rows, repeat a few times, and check the timings. And this is the test performed, using pgAdmin III, and the pgScript feature. 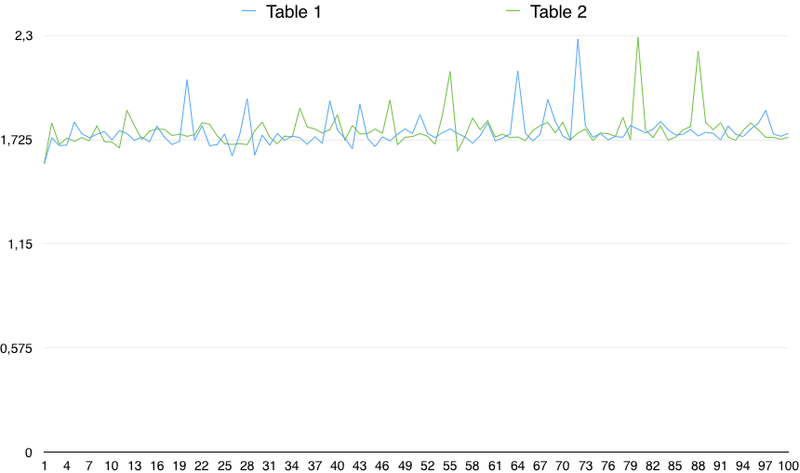 So, in practice, the CHECK(column IS NOT NULL) is very slightly slower (by a 0.5%). However, this small difference can be due to any random reason, provided that the variability of the timings is far larger than that. So, it's not statistically significant. From a practical point of view, I would very much ignore the "more efficient" NOT NULL, because I don't really see it's significant; whereas I think that the absence of an AccessExclusiveLock is an advantage. Not the answer you're looking for? Browse other questions tagged postgresql postgresql-9.5 check-constraints or ask your own question. What is the syntax to add a constraint on an already-created table?